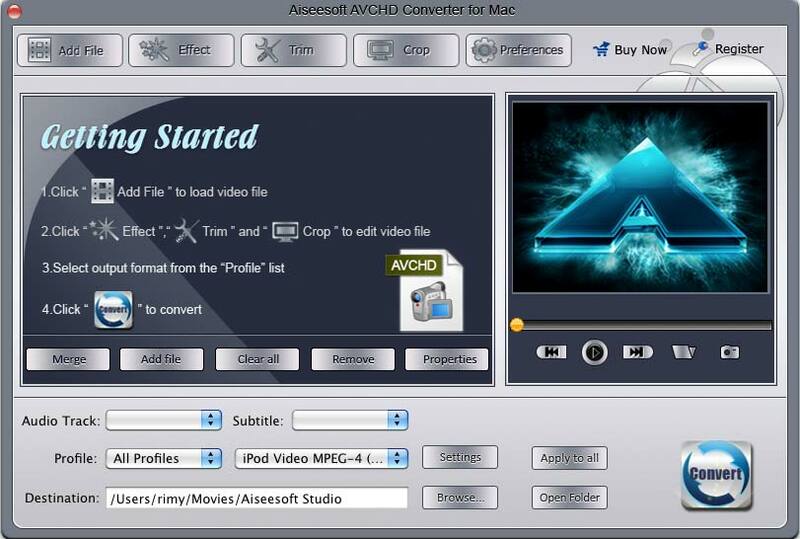 Aiseesoft AVCHD Converter for Mac, advanced Mac AVCHD Converter for Mac OS X users, which can convert AVCHD video to your portable players, or edit your AVCHD video in professional way. Besides convert AVCHD(.mts, .m2ts), Aiseesoft AVCHD Converter for Mac also helps you to convert other HD video or General video to your devices in fast conversion speed and great quality. Use snapshot to capture your favorite scene from the video. ...... output video Brightness, Contrast, Saturation and Volume. Checking Deinterlacing is to convert interlaced video to the progressive one to avoid mosaic. Qweas is providing links to Aiseesoft AVCHD Converter for Mac 3.2.36 as a courtesy, and makes no representations regarding Aiseesoft AVCHD Converter for Mac or any other applications or any information related thereto. Any questions, complaints or claims regarding this application Aiseesoft AVCHD Converter for Mac 3.2.36 must be directed to the appropriate software vendor. You may click the publisher link of Aiseesoft AVCHD Converter for Mac on the top of this page to get more details about the vendor.